Located at the foot of the Sussex Downs, the track is the only classic circuit in the world to remain entirely in its original form. Goodwood Motor Circuit originally opened its gates to the public on September 1948, to host Britain’s very first post-war motor race meeting at a permanent venue. The entire course is inside the Goodwood Motor Circuit on the roads/paths not on grass. The race involves laps around the circuit. 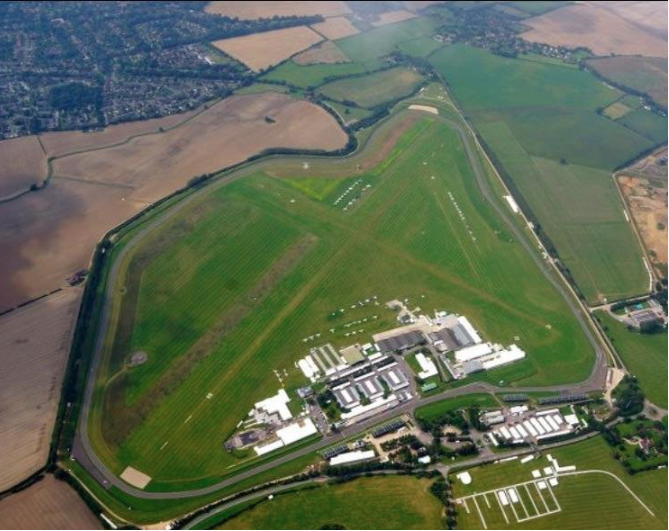 The 5k will be 1 lap, 10k is 2 laps, the Half Marathon is 5 laps and the Marathon will be 11 laps of the circuit. Good wood is located just outside Chichester, only 60 miles from London, and 30 miles from Brighton and Southampton. Follow the A3 (Junction 10 on the M25) south towards Guildford. About 3 miles past Guildford, at the Milford turning, take the A283 to Petworth, then the A285 to Chichester for about 6 miles. Follow the A27 to Chichester. At Chichester, stay on the A27 bypass/ring road. After the only set of traffic lights, take the second exit at the next roundabout signposted Goodwood. At the next roundabout take the second exit. 200 yards after the Goodwood Motor Circuit & Aerodrome entrance, straight over at the roundabout, (brown signs for Goodwood House). Entrance to House is on the right. There is a regular service from London Victoria to Chichester (1hour 40 minutes), plus the coastal service from Brighton and Portsmouth. Buses or taxis are available at Chichester Station. Don't forget something warm to wear after your race! There are multiple points around the race track to watch the runners and cheer friends and family on during their races! What is the minimum age to enter an event? 11 years old for a 5k, 15 years old for a 10k and 17 years old for Half Marathon. I can't make the event, can I have a refund? Sorry, we don’t offer refunds. However, if you let us know 14 days in advance of the event we can transfer your entry to a friend or to a later event. This was a really well run event with a nice atmosphere. Great marshalls and good communication in the lead up. My only negative feedback: quite a few reports saying the course was a bit long for the Half and Marathon (about 800m for the marathon & 500m for the HM). Also, no toilets right beside the track so I had to jump a fence or fight through the mass of runners warming up for another distance to get to the loo. Perhaps a little corridor cordoned off for runners to the dash off the track to the toilet block might be a good idea for next year. Would definitely consider doing this race again though! Great pre run information with good parking and lovely Marshalls. A PB for my 10k was just the topping on the cake. Runners village was fab and lots of great giveaways so thank you everyone for a fantastic day. If I book in for the 10k race can I opt to do the 5k race on the day? This should not be a problem at all, as long as you notify the race organiser the morning of the event. Hi there. Yes you can, you just need to let the information desk on the day know. Good luck! Is this a UKA measured/approved course for the marathon distance? Hi there. Just to confirm, this event is officially measured and UKA certified. I have signed up for this marathon but picked up and injury in the last half marathon i ran am i able to cancel my entry and get a refund? When do we get are race numbers? Hi there. Just to let you know that all race packs are to be collected from the event village on the morning of the event. Best of luck! If a lap is 5km, how come the half is 5 laps? Hi there. Just to let you know that the half marathon will be 4 whole laps and part of a 5th. The finish will be clearly marked on the course. Best of luck! I am hoping to bring my family as a cheer squad. Do spectators require a separate ticket? Hello, just to let you know that your family will not need to buy separate tickets to cheer you on, so you can bring as many people as you like. All the best! Is there a cafe at the race track? Hello, just to let you know the Motor Circuit Cafe is open from 8:30am Monday to Sunday and with a full breakfast and lunch menu being served. All the best!